Starting tomorrow, the Cubs have a very winnable stretch of baseball (Pirates, Tigers, Reds, and Mets for 13 games) followed by a very tough stretch of baseball (Braves, Phillies, Brewers, Nationals, Brewers for 14 games). With a thin first-place lead, you have to hope they do well enough in that first stretch to mitigate the risk heading into the second stretch. The Cubs should get some reinforcements in the form of Kris Bryant, Brandon Morrow, and Yu Darvish by the time that second stretch starts, but still. Or they could just play balls out during both stretches so that they have a comfortable second half of September to prepare for the playoffs. That’d be cool, too. 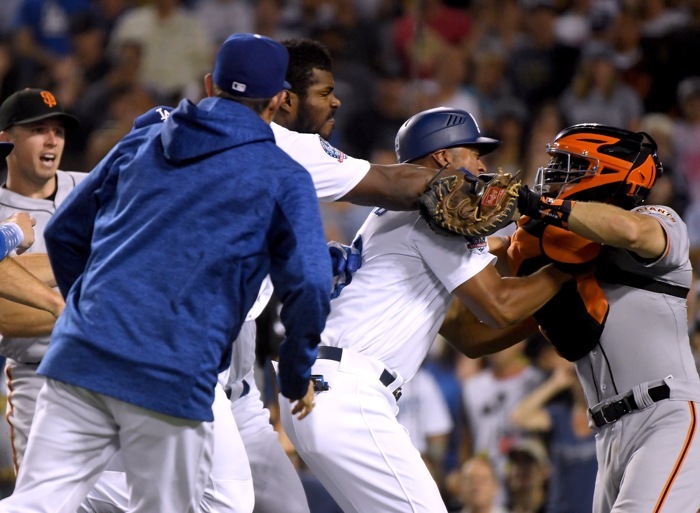 Hundley apparently told Puig to stop complaining and get back in the box, so Puig got in his face and “when I [Puig] got into his face he [Hundley] told me to also get out of his face, so that’s when I got upset.” So, Hundley got mad at Puig for being mad, and then Puig got mad at Hundley because Hundley was mad at Puig? Roger that. In any case, it seems the tight NL West race is re-igniting the rivalry. The Giants may be in fourth place, but they’re just 5.0 games back and the other three teams in the race (D-Backs, Rockies, and Dodgers) are all within two games of first. Baseball America had Baz as the Pirates third best prospect at the start of the season, and he’s since made 10 starts with a 3.97 ERA (3.91 FIP) in rookie ball, which is quite good. The Pirates paid a whole lot for Archer and his team-friendly contract. That’s Brewers GM David Stearns saying “It’s probably a little bit tougher to see him making a significant impact during the month of September for us.” And when pressed on if Nelson could at least return in the bullpen, Stearns repeated essentially the same thing. From the sounds of it, Brewers fans shouldn’t expect him back this year in any capacity. The stupid Cardinals have won a season-best seven games in a row, thanks, primarily to an increasingly unbelievable stretch by Matt Carpenter. Since that 5 for 5 game against the Cubs just after the break, Carpenter has slashed .320/.439/.790 with 14 homers in 123 plate appearances, good for a 212 wRC+. I hate them. And thanks to the Cubs’ slow start out of the break, the Cardinals are now within 4.0 games of first place. Sigh. Ronald Acuña has not just hit a home run in five straight games, he’s hit six total home runs in four days thanks to a double-header. And before that stretch, he went 3-5 with a double, 1-4 with a homer, and 2-5 with a homer. Yep, since August 8th, exactly one week ago today, Acuña – who is 20 – has EIGHT homers, two doubles, 13 runs scored, 15 RBI, and two stolen bases. He is on fire. What a debut it’s been. According to ESPN Stats and Info, Acuña is the youngest player to homer in five straight games – and this streak is the longest since 1996. In yesterday’s MLBits, we discussed Trevor Bauer’s candidacy for the AL Cy Young award, but today we have to report that he’s hitting the disabled list with a stress fracture in his fibula. There’s no timetable for a return just yet, but it sounds like he should pitch again this season. What this time away will do to his Cy Young odds, though … well. Brandon McCarthy is planning on retiring at the end of the season. Brandon McCarthy wants to retire at the end of the season and he currently has 69 wins and a 4.20 ERA for his career. He should … Retire right now. Previous PostPrevious post:Now is Not the Time for Contract Talks with Joe Maddon, But When Is?